The ridiculous media overreaction to the Randy Moss "mooning" at Lambeau Field made me once again ponder retirement from all this and consider starting my own business as a sports broadcasting and sports journalist consultant. Clearly, my peers need help. In this age of sports media oversaturation, my peers are in need of someone to call for advice about when it is and isn't appropriate to shred an athlete, a coach or an executive for poor behavior or decision-making. 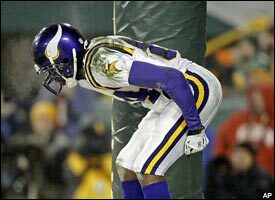 C'mon...if the Vikings had lost, Moss and his teammates would have been mooned for real. Because so many media people are crawling all over each other to make sure they can be the first to blast an athlete publicly, it's obvious we now require some sort of commissioner to sit in judgment of all the ripping and shredding. I'm the man for the job. I've been second-guessing and ridiculing coaches for as long as I can remember. My seventh-grade football coach, Janis Janelsin, who was quite possibly the finest junior-high football coach in all of America, was the first victim of my acid tongue. Mr. Janelsin's questionable end-of-game play-calling and near misuse of some late-game timeouts caused my Stonybrook Redskins to tie Carmel rather than win. I lambasted our coaching staff the whole bus ride home. By the time I hit high school, I was a frequent caller to Bob Lamey's night-time sports-talk radio show. I specialized in beating up the Indiana Pacers for their various crimes against basketball common sense, including their consistent acquisitions of every slow-moving, non-athletic 7-footer in the league (Steve Stipanovich, Greg Dreiling and Stuart Gray) and their decision to turn back-to-the-basket scoring machine Wayman Tisdale into a face-the-basket, put-it-on-the-floor, only-somewhat-effective small forward.